When searching for the key to a long cancer-free life, there is one place that few people want to look—which is directly into the beady, unblinking eyes of a hairless underground horror. 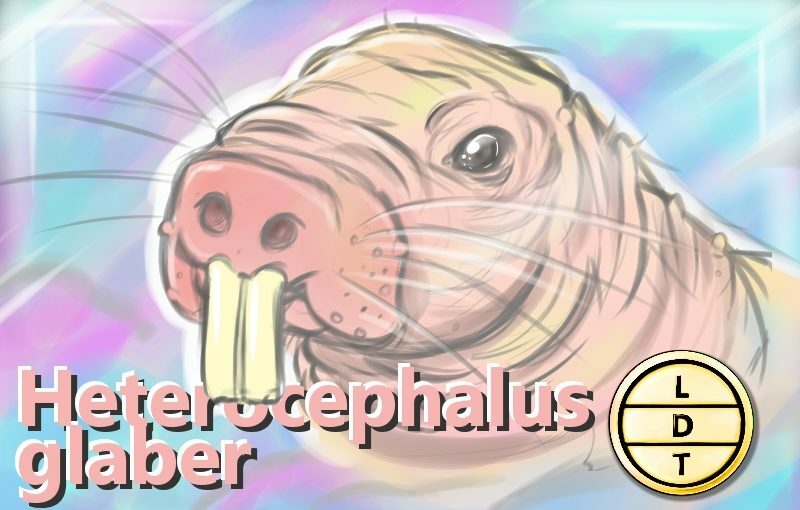 Enter the naked mole rat, the sort of cold-blooded super ugly mammal with cells that loath social contact. But hey, maybe we’ll find the cure to cancer here in Life Death and Taxonomy. The naked mole rat live in the deserts of East Africa. The burrow underground and spend most of their lives digging for roots in vast subterranean tunnel systems. They have teeth on the outside of their mouths. This allows them to close their mouths while they dig with their teeth. These teeth come in a lower and upper pair. And can move independently. A quarter of their muscular power is in their jaw. They are mostly hairless except for some whiskers and sparse fur. They have tiny eyes and poor eyesight. Their skin is loose and wrinkly which helps them to squeeze by each other in tight tunnels. Live in colonies like bees and ants with one dominant queen and sterile worker and soldier females. Queen keeps one or two males for mating. This is called eusociality, highly structured societies. Colonies are important because of the allocation of resources in the desert. Roots are their primary food source but they are large and widely dispersed. One rat would have a hard time locating enough food on its own. A colony can split up and bring back large roots for everyone. Can thrive in 5% oxygen. Oxygen can be scarce in crowded tunnels. Rats have a special hemoglobin that has a high affinity for oxygen in the blood. It can pick up tiny amounts of oxygen in the bloodstream and use it efficiently. At extremely low oxygen, they go into coma-like states to conserve oxygen. In this state they can last longer than 15 minutes with no oxygen at all. They do this by burning fructose for energy instead of glucose in low oxygen circumstances. Other mammals burn glucose because it’s more efficient. But it requires oxygen to burn. Fructose can burn without oxygen. For rodents, the live a pretty long time. They hold the record for longest living rodents, up to 32 years. This might have something to do with that metabolism method. They also don’t show signs of aging during their lives. Their anti-aging ability, and their ability to thrive with low oxygen has made them popular study subjects. Their genome is closed to being mapped with a working draft being published in 2014. The fructose burning ability my hold the antidote for heart attacks in the future. Unrelated: their tunnel systems have special chambers for bedrooms and bathrooms.